Sorry for the blogging silence over the last couple of days. Matt is off in Silicon Valley for work again & I'm home alone eating leftovers or grabbing a burger out. Last night though I figured I better cook up the chicken breasts I had in the fridge. A little more foraging found half a lime & some cilantro that needed to be used as well. I grabbed a bottle of Matt's tequila & made it all into a meal. This made for a tasty, light dinner with very fresh flavors. I topped it with a little sour cream for a some creaminess. I can see Matt adding some hot sauce or salsa for extra zing. As good as this was on its own, I think it would even be better wrapped in a tortilla. Put the chicken into a small sealable bag. Mix the tequila, honey, salt & chili powder together. Heat in the microwave for about 10 seconds. Stir to mix everything together well. Pour the tequila mixture over the chicken. Seal the bag getting out as much air as possible. Let marinade in the refrigerator for 30 - 60 minutes. Cook the rice according to the directions adding the lime juice & zest with the water. When finished cooking stir in the cilantro. When the rice is just about done, heat the vegetable oil in a large skillet or wok over high heat. Add the chicken & the tequila marinade (careful it will splatter). Sauté until the chicken is cooked through & the sauce has cooked down some. Serve the chicken & sauce over the hot rice with optional toppings. I think southwestern flavors are some of my favorite -- and so versatile. Love cilantro lime rice, so why not throw some chicken in and make it a meal? oh yes i do love the taste of tequila in chicken. haven't done this in ages. this reminds me of summer grilling. P.S. I don't have any real estate or drugs. Last week's whiskey mac and cheese followed by this week's tequila chicken? We like where you're headed! Creative and delicious. It looks delicious! I know what you mean about leftovers and foraging in the fridge. BTW - that mac & cheese BEST EVER! We loved it! that sounds awesome! I think that will be dinner! 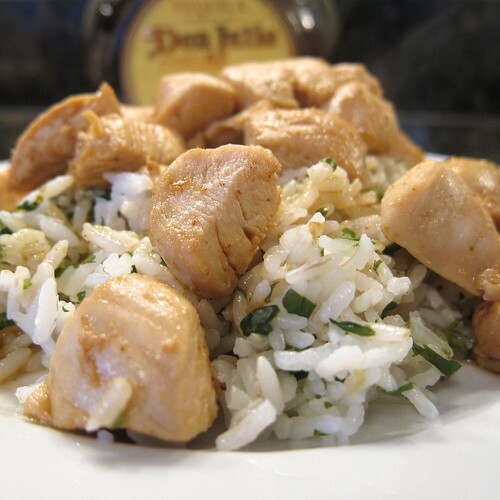 the cilantro-flavored rice is the perfect accompaniment to your awesomely boozed-up chicken. this is tasty, the end. That's a great use of things you find leftover in your fridge. You got me at tequila. hehe. I love the flavors of lime and cilantro in rice. I think I have this combination every week. I like the tequila, honey and chili powder marinade that you have for the chicken. It sounds so festive. Seriously Yum! I am always trying to add alcohol to my meat, hahaha. Can't wait to try the rice too, I have tried a few but no sure thing yet.